A Belgian, very passionate instructor (Anthony) along with his energetic Dutch friend (Lisette) will, with a positive drive, help you to get onto the water as fast as possible. 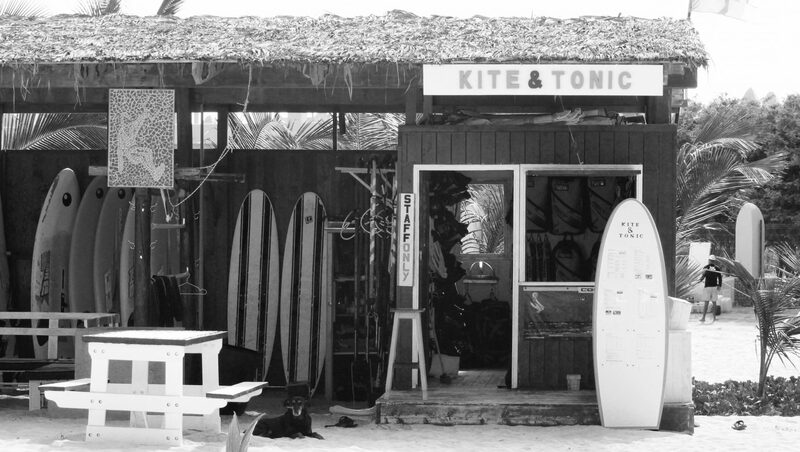 The majority of our kitesurflessons will be instructed by the owner of the school (Anthony). He can teach you the ins and outs at the level most suitable for you. Anthony teaches in Dutch, French, English, basic German and Spanish. Our additional instructor and windsurf-specialist (Gabry) teaches in Spanish, Italian, Portuguese and Creole. Kite & Tonic is the only established kite school at the southwest side of Sal, in front of the Riu hotel (also known as Riu Beach). It’s a 20-minute walk from the centre of Santa Maria or accessible within several minutes by cab (EUR 2,70). It’s a 15-minute walk from the hotels Melia, Criola and Hilton or within a few minutes by cab (EUR 1,80). On the beach many free deckchairs with parasols are available, so your company can enjoy your moves on the water whilst they relax in the sun and on a wind-free beach. After a short walk on the beach you will reach a lovely restaurant where you can have lunch during the day. There is fresh water to wash of you material. In short: the perfect location and school for you, your family and/or your friends. Crystal clear water, white sand and no rocks: the dream of every kiter. The wind direction is side-shore, side-off shore and occasionally side-on shore which ensures butter flat water. In short: perfect for freestyle or big air. There is a rescue boat available from 8.30 – 17.30 (EUR 30/rescue). Do you prefer waves, you can cross-up 5 minutes towards Ponta Preta to sail the world famous dream waves. The waves have no influence on the spot. The wind is not blocked by buildings and is therefore constant and strong. There is space enough on the beach to land and launch. No rocks, only white sand. In short: spacious, delightful wind, plain surface and waves for the fans. Check kite spots to compare our spot with the other spots on the island.